This level has medium difficulty. 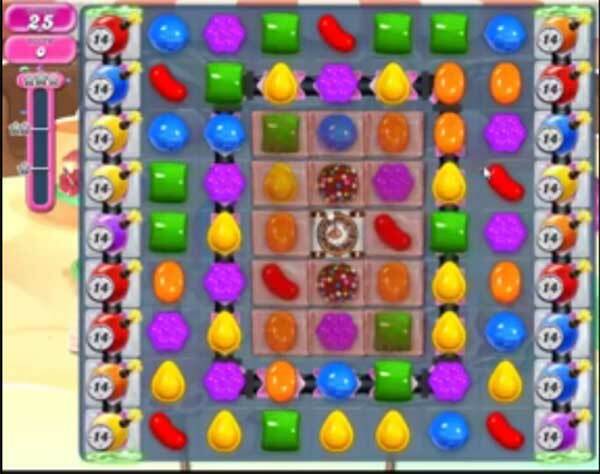 For this level try to play near to blockers and combine colorbomb with striped candy as you get the chance to break the jellies and timer bomb. Or play with remaining jelly candy to break them all. They must have changed things – for me 1340 has only 15 moves, not 25, and the bombs go off in 10, not 15. Very frustrating! Are there different versions of the game? I agree, only 15 moves. Not enough. I also have less moves, f** you CC done with it. You don’t give what you promise. ???? hope you Will lose all your players. Must be time for it. Again less moves . In the walk through you have ten more, CC you are bringing your game under zero. Good luck with lozing players, you deserve it. So done with this game, you don’t get what they promise.??? go to hell with your game. I am done with it. It Seems that they change the level, What a bad ideale. I tell everyone to stop playing this game, and you know What? I can prove it. I show them the level and the walk through, Haha, they stop imidialate playing CC. Haha. Bravo CC you are on the right move,, playing your zelf down under.????? Unbelieveble I stop playing two months ago. From my Fries I hard What CC is ding. So ook sad. They distroy therapie own game. Yeh, yeh,. People , time to look for a fair and funky, not king size game. ?????? Too many bos, les moves they promissed, good work cc, your players hooked off, so at the end….. You won’t have players left. Bravo! I ALREADY FIND ANOTHER, NOT KINGSIZE GAME. Believe me I have more fun playing a game,! 1334 was almost impossible but 1340 is just another nail in the head not much logic and hopefully a good board. I only have 10 moves before the bomb goes off also only have 15 moves. Can,t do it. After many tries I finally passed this level! I found it best not to concentrate too much on the bombs but on the center of the board and that did the trick for me!